Expand your thickness inspection capabilities with the StressTel T-Scope III with waveform display. With the largest A-scan waveform display in its class, the T-Scope III lets you quickly and accurately confirm backwall echoes and verify the digital thickness of critical components. Thickness readings and waveforms can be stored in linear, grid, or boiler data files to generate direct-print reports or to down-load to inspection data management programs like StressTel's GRIDWARE 2000. The T-Scope III also has a dual-multiple test mode allowing measurement of heavily corroded walls through coatings. You can customize the T-Scope III to your inspection by choosing one, two, or all three options. 5 "AA" Alkaline or NiCad batteries Interchangeable and easy-to-access Operating time: 60 hours w/o backlight. 0.020 to 20.00 in/0.50 to 500 mm depending on transducer and materials. Two adjustable gates to select proper echo(es)/measurement area and to ignore unwanted signals. T-Scope III Ultrasonic Thickness Gauge. Dual element transducer with Cable. 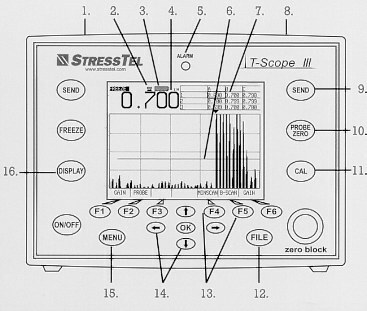 The T-Scope III is manufactured in an ISO9001 facility. The T-Scope III has a full two-year warranty on parts and labor excluding batteries, transducer and cable. Specifications subject to change without notice.